Rich Approach is basically the same as an approach to equilibrium, and is intended to give the user a quick idea of whether the circulation rate is suitable. In the 70-80% range, the circulation rate is usually sufficient. If the Rich Approach is above 80% then an upset in the system such as higher acid gas in the feed or increase in feed rate to an amine absorber might lead to a significant increase in acid gas in the treated stream, possibly leading to off-spec gas. Below 70% Rich Approach can indicate over-circulation unless other considerations such as corrosion or foaming require lower loadings. The Rich Approach calculation is an iterative method which adiabatically removes material from the rich solvent stream as it has been calculated by the staged absorber column until equilibrium is reached. This calculation method can be thought in terms of a “black box” as shown below. 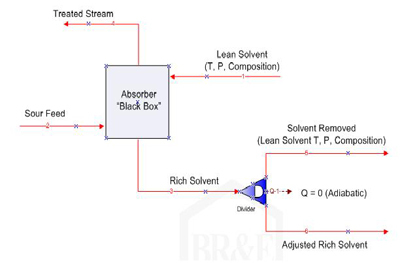 Composition and duty of the Lean Solvent stream are removed from the calculated Rich Solvent stream, the enthalpy of the Adjusted Rich Solvent stream is used to calculate the temperature, and finally the temperature and composition are used to calculate the partial pressure of the Adjusted Rich Solvent. This calculation would in effect be similar to using a Divider block which takes a fraction of the specified Lean Solvent stream (say 1% of each and every component in it) and removes that much of each component from the original Rich Solvent flow, and then subtracts the same fraction of the enthalpy of the Lean Solvent from the enthalpy of the Rich Solvent flow (note that when the lean amine is at a higher temperature relative to the rich amine, the calculation sometimes fails for this reason). These iterations continue until the calculated partial pressure of the designated component in the adjusted rich solvent matches the partial pressure of the same component in the sour inlet gas (or liquid) feed stream. At this point equilibrium is assumed. As an example, if the calculation removed 25% of the Lean Solvent stream from the Rich Solvent stream to achieve equilibrium, then the Rich Approach (or approach to equilibrium loading) would be 75%. The Rich Approach parameter is only meaningful if the Lean Approach is greater than 90%. In cases where acid gas is slipping (e.g. CO2 in a generic MDEA case, H2S in a case with too few stages to reach equilibrium, etc. ), the Rich Approach is not a very useful number as equilibrium would never be achieved, resulting in a conservative or high value. Note that in highly non-ideal solutions, such as amine systems where chemical reactions are taking place in the liquid phase, the Rich Approach (or maximum loading) cannot be determined as simply the ratio of the partial pressures. Due to the reactions taking place, the partial pressure of the total acid gas inventory changes drastically as the amine loading changes the ratio of ionized to non-ionized acid gas subspecies in the liquid phase. Only the non-ionized subspecies can vaporize; ions are trapped in the liquid phase and have 0 partial pressure. When the amine is lightly loaded, virtually all the acid gas in the liquid exists in the ionized form and the partial pressure is very low. As the loading increases, more and more of the acid gas remains non-ionized and thus able to exert a partial pressure. If the partial pressure from these lightly loaded solutions are extrapolated into the higher loading regions, the maximum loading will always be over-estimated, possibly by an order of magnitude. The only way to even approximate the maximum loading is the method used by the ProMax Rich Approach specification. The ionized species can be viewed in the liquid streams by using an Ionic Info Analysis, or by clicking the Ionic Info button at the bottom left of the Stream Composition tab.